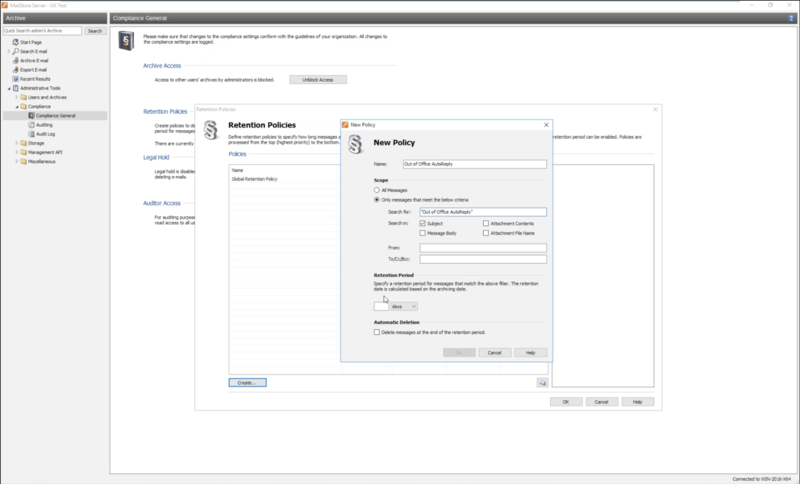 The highlight of the release is undoubtedly the new retention policy management tools. At the point of writing, there isn’t anything in the GDPR which actually defines the length of time you should keep email, however, the gist of the ‘Principles’ section in Article 5 is simply that you shouldn’t be storing personal data for longer than you need to, or than is appropriate. So it’s good practice to have a retention policy, not least because keeping more data than you need limits the risk should you experience a hack or breach of your systems. In the context of GDPR, using policies to delete data you don’t need is an easy way to reduce the work you’ll need to do should you receive an ‘erasure’ request. If you’d like to simply create a global policy across the business that ensures you won’t be keeping anything older than, say, 10 years in the archive, this new feature makes that quick and straightforward. 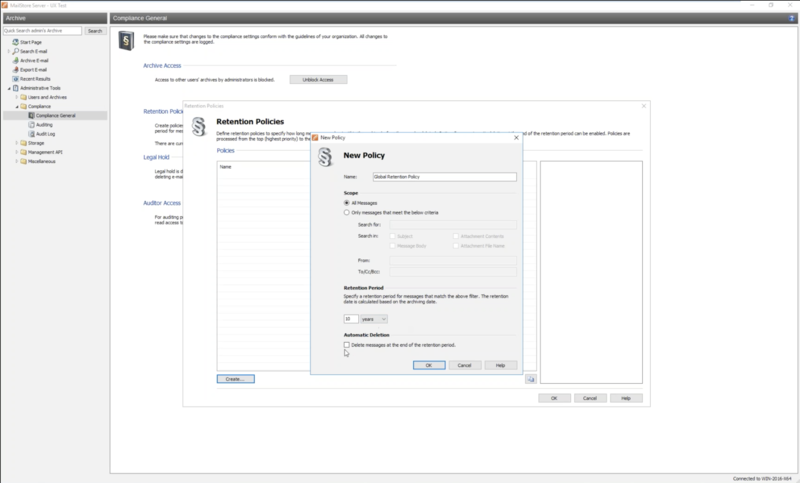 The screenshot below shows the policy builder window with the first policy to be executed at the top and subsequent ones underneath. If you want to go beyond a blanket retention policy, you can get a little more clever and layer additional rules which act upon the content in the messages themselves. This part of the product is using many of the same options available to users in the search interface, so you’ve got some fairly flexible options there. The example below shows how you might set a policy for deleting ‘out of office’ responses, but you could, of course, apply this to numerous scenarios depending on your requirements. No company should be without a reliable backup strategy, and to help MailStore administrators ensure their archive is always a part of that, Version 11 now alerts if it doesn’t detect any recent backup jobs having been executed. Alerting appears on the application’s dashboard and also in the status reports delivered via email. In case you’re not already familiar with the acronym, TLS (Transport Layer Security) protocols as they’re known, are a method for encrypting data in transit between two devices. As a topic, they’re receiving extra attention at the moment, in part because they’re mentioned in the ‘Data Transfer‘ section of the GDPR documentation but also because as of 30th June 2018, the latest PCI DSS compliance requirements state you must be using at least version 1.1. The MailStore team has this box ticked thankfully and following your upgrade to Version 11 you’ll be able to rest easy knowing there’s support available for both TLS 1.1 and 1.2. As a side note, they’ve also disabled authentication over an unsecured connection to tighten overall security. Another minor update, but an important one for security, is that MailStore’s Web Access will now receive any available updates automatically. So rather than having to keep an eye on this manually, you’ll always be on the latest and greatest version available provided you have a current installation. 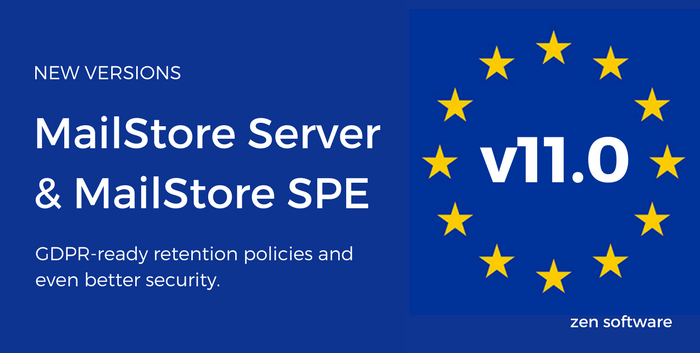 Last but by no means least, if you’re using the wonderful Service Provider Edition (SPE) for multi-tenant environments, your installation will now perform an automatic check for updates. Keeping your software up to date is actually a requirement of the SPE terms so this makes it easy to ensure you don’t overlook a release. Notifications will again appear on the dashboard as well as optionally via email any time there’s something new available. So don’t delay, provided you have current upgrade protection, you’ll be able to download and install the latest version of MailStore Server using the link below. If you’re not sure of your key’s status, you can check easily by entering your key into the upgrades checker on our site. Service providers interested in MailStore SPE can register here free of charge and receive access to the trial version, videos, help on hosting, cost model templates and lots more!